Buy a bottle of Sipsmith London Dry Gin from Thursday 21st March to Wednesday 27th March and you'll get a £5 discount at Bloom & Wild - perfect for Mother's Day Flowers! We'll send you your discount code on Wednesday. This multi-award winning Gin was launched in 2009, having been made in the first copper still in London for nearly 200 years. It led the way for the whole modern craft distilling movement. "The quintessential expression of a classic, traditional London Dry Gin." Bold, complex and aromatic, perfect for a G&T - in which you'll taste hints of orange marmalade and lemon tart. 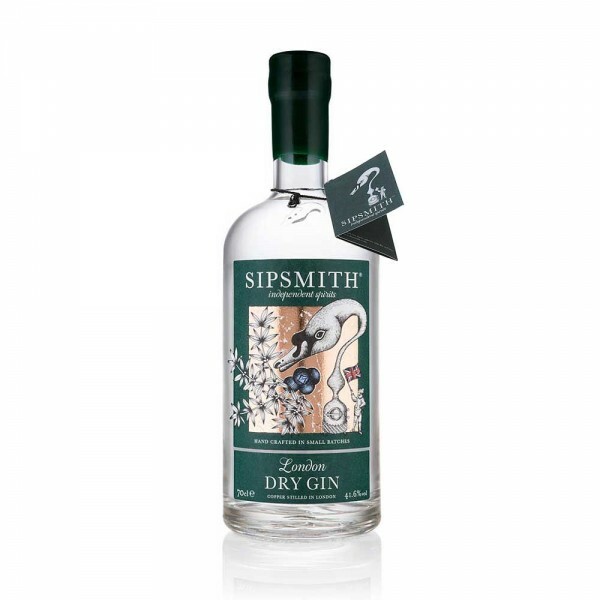 The 10 botanicals in Sipsmith London Dry Gin are sourced from all over the world: Macedonian juniper berries, Bulgarian coriander seed, French angelica root, Spanish liquorice root, Italian orris root, Spanish ground almond, Chinese cassia bark, Madagascan cinnamon, and Spanish lemon and orange peel. "They're a cosmopolitan mix but traditional at the same time. There is nothing here that would surprise a master-distiller from the nineteenth century." The botanicals are blended with Lydwell Spring pure water to create its dry and zesty finish. Floral, summer meadow notes, followed by mellow rounded juniper and a zesty, citrus freshness. Dry juniper leads, then reveals lemon tart and orange marmalade, before all the flavours harmonise. Dryness leads, with spicy juniper and a hint of lemon tart at the end. Feel like you are in the heart of London with a Covent Garden Hotel’s Seven Dials Cocktail. Pour 40ml Sipsmith London Dry Gin, 10ml Southern Comfort, 10ml of Elderflower cordial and 10ml lemon and orange juice into a cocktail shaker. Add a few ice cubes, shake well and strain into a chilled Martini glass. Garnish with a passion fruit wheel. Fill a pre-chilled glass to the top with ice, pour in the Gin, and top up with Tonic Water to taste. Garnish with a lemon twist (make sure all of the pith has been removed) or wedge of lime, having run the citrus around the lip of the glass before dropping in to your delicious drink. Sipping perfection!